I feel like I’ve been going on and on and on about potatoes recently. Potatoes, potatoes, potatoes. I’ve been eating potato farls for breakfast and spicy potato wedges with friends, and have been thinking a lot about attempting to make gnocchi from scratch again (I failed drastically when I tried a few years ago). I even ended up talking about the versatility of potatoes with my PhD supervisor in a supervision last week. Then my potato-streak finally broke and I felt I had to replace potato with cauliflower mash, to give my body a bit of a potato-break. After a few days away, I’m ready to return to my beloved. As today was a beautiful sunny spring Sunday, the only thing I wanted for lunch was an oily, herby potato salad with lots of fresh veg. 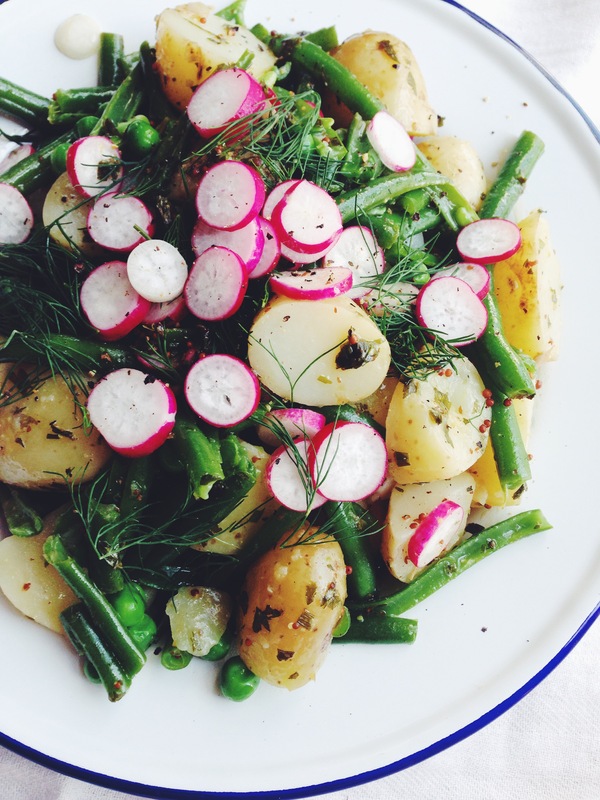 Here, then, is my recipe for the perfect herby spring potato salad, based very roughly on Hugh Fearnley-Whittingstall’s new potato ‘tartare’ salad from Veg Every Day. 1) Halve and boil the 500g baby jersey royal potatoes for 10-15 minutes. 2) Make the herb and oil sauce. In a small jar or bowl, mix 1tbs chives, 1 tbs parsley, 1/4 tsp salt, 1/2 tbs cider vinegar, 1 & 1/2 tbs rapeseed oil, 1 tsp wholegrain mustard. Chop 7-10 radishes into discs, and separate out some ‘bits’ of dill (are they fronds? leaves? I’ve no idea what to call them!). 2) When the potatoes have been in for about 10 minutes, trim and steam 200g fine green beans, for around 5 minutes. Steam the peas in with the beans. 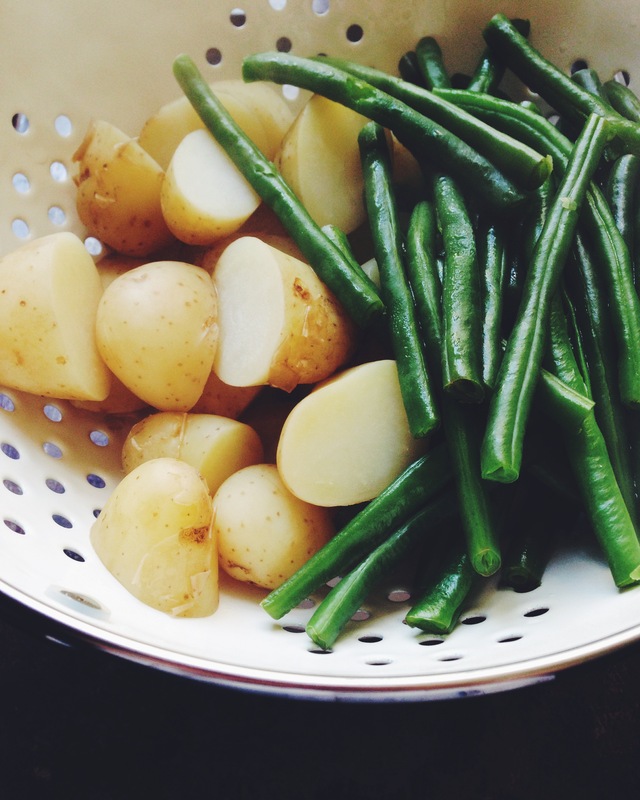 5) When the potatoes, peas and beans are cooked, drain them and put them all in one of the warm-but-empty pans. Drizzle the herb mix over, and mix in. Add half the radishes and dill, and mix again. At this point you can either add a big dollop of (vegan) butter, or go for the healthy-but-dull option and leave it out. 6) Serve up: top with a generous sprinkling of black pepper and the remaining radishes and dill. Enjoy!